WineConnect is the leading source for beer, wine, and spirits data and image services. Freemind is partnering with WineConnect to provide advanced, full-featured solutions to retailers of all sizes. We designed and implemented an eCommerce platform to support online wine browsing and purchasing for a multi-tenant, custom-branded storefront architecture. 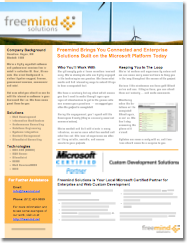 Mailing list and email marketing was integrated via web services with the Constant Contact platform. Freemind created a dynamic image scaling and transformation framework with tunable caching to increase performance. We implemented and continue to work with an Agile development process which keeps well-defined, manageable, and moving forward. To see how Freemind Solutions can work with you to build world-class eCommerce applications to your customers, please contact us via email or call us at 612.424.9699. Freemind Solutions is proud to present the Minneapolis ALT.NET User Group. ALT.NET is about alternative tools and approaches to mainstream .NET development. There is a lot to like about developing in .NET, but we like to always have our eyes open for better possibilites, embracing simpler, more elegant open-source tools and technologies. Tools that allow us to get things done. Check out all of the details here and sign up to get the latest updates. We're doing project work and consulting on-site with our clients. We're always interested in hearing about opportunities in both of these areas. Print a quick one-page PDF outlining our services and qualifications. Contact us when you're ready! © 2010, freemind solutions, inc.